It is easy to find your ALFA ROMEO colour code: you just need to to find the label or plate in the car where the original paint code is written. Just follow our instructions below to discover where it is situated in your car and how the paint colour code plate appears. 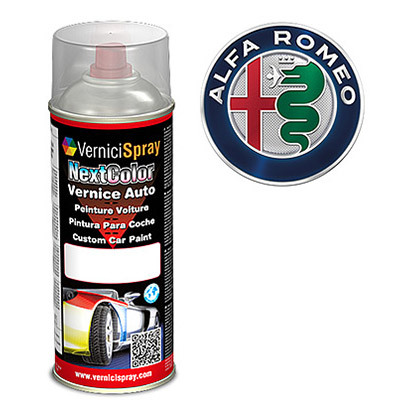 Thanks to that example color identification plate, you should easily identify what is the ALFA ROMEO paint code, but if you need our help don't hesitate to write us at info@vernicispray.co.uk, sending us even a photo of the label you have found. On the color identification plate you could read not only 601, but also 601A, 601/A or 601B: in any case when you use our research it is better to search only the numerical code, avoiding to write also the letters, so that you will be shown all possible results.